This June 1963 Pre-Aeroflow car is owned by Will Payton, and is a recent purchase made in Spring 2012 . It is the latest, and possibly the last, restoration to be completed by Trevor Barefoot, and is one of the most authentic cars of this variant existing. At the Lotus Cortina 50th celebration at Brands Hatch in August 2013, it won best car award from a field of over 80 Lotus Cortinas, the largest gathering of the cars ever seen. 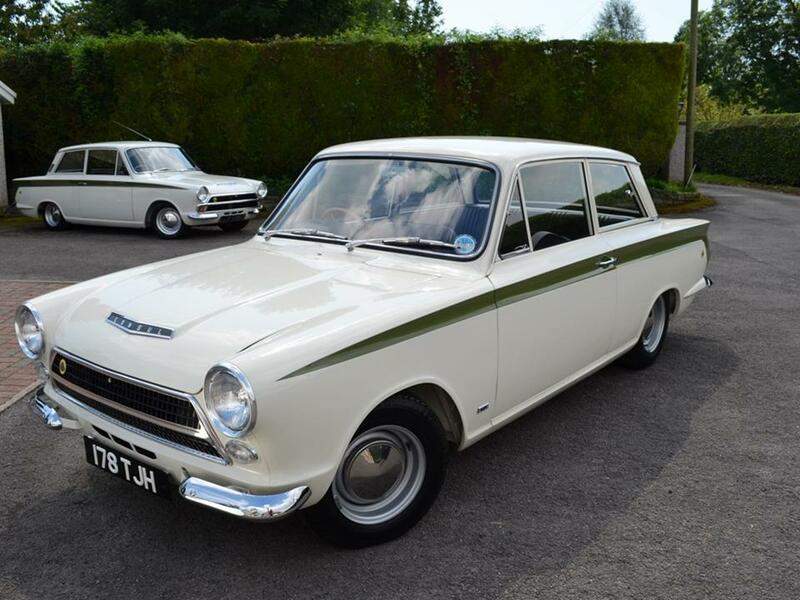 Trevor Barefoot is very well known in the UK for creating some of the most authentic restorations of Mk 1 Lotus Cortinas, specialising almost exclusively in the Pre-Aeroflow cars. He has owned some of the most desirable Lotus Cortinas, including 550 VAR (ex Jim Clark road car with independent suspension) and BMK723A, the 3000 miles from new ex Chapman museum ex-Great Train robber car, along with several ex-works cars. This experience, along with that gained from the other 30 or so Mk 1 Lotus Cortinas that Trevor has owned and restored, has given him an encyclopaedic knowledge of the cars. His knowledge has translated into the detail that has gone into 178 TJH, and that detail and level of finish of the car is simply breathtaking. 178 TJH was is pretty good order to start with, having been dry-stored for 30 years. There was no wholesale panel replacement for this car, but just small, invisible repairs made in order to retain as much as possible of the original fabric of the car. Some 2000 hours were spent getting this body absolutely correct. That craftsmanship shows in the finished car, with original weld patterns on display in all areas of the car. Of particular interest is the method of attachment of the strengthening brackets in the boot, and the spot welds in the boot floor itself, all of which are as they left Dagenham in 1963. Trevor rates this car as the most authentic early Pre-Aeroflow car in existence, alongside BMK723A of course, and folks that have seen it all agree. I am very grateful to Will for spending the (rainy!) day having his car photographed inside, underneath and on top. When he phoned to say he’s bought it, he sounded a little nervous about the car, having bought the most expensive non-works Lotus Cortina ever. However, this car is on a completely different level to other restored Lotus Cortinas, and thanks to Will’s generosity, we can now all benefit from seeing, in considerable detail, what an authentic early Pre-Aeroflow Lotus Cortina looks like. Thanks also to Roy Parkhouse, who took many of the photographs used in this section. One piece ‘Torpedo’ propshaft up to July 1964, then split. Dunlop ‘Hytone’ rubber mats instead of carpets. Instrument ‘pod’ with Elan-derived instruments.